Magento is the world leader in the segment of open source e-commerce solutions. Today, the word «Magento» is requested in search engines with the same frequency as the word «eCommerce». 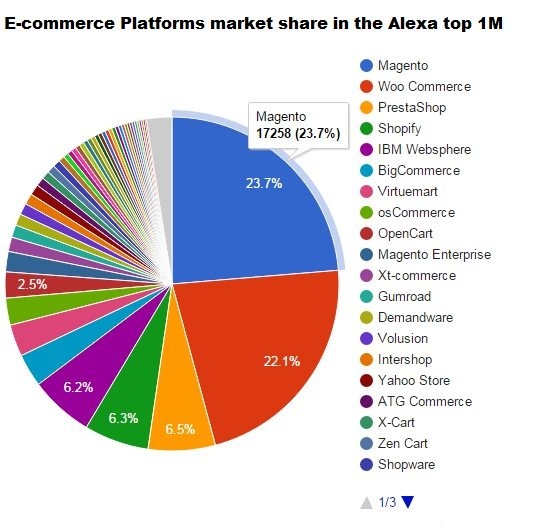 Based on the list of Alexa top 1M global sites – Magento is the leader in global e-commerce platforms market share with 23.7% or 17258 websites. In a global perspective, the industry analysis shows how the market share is divided between different countries worldwide. The leader is the United States with 38.56% and then go the European countries: Germany has 14.68%, Great Britain (the UK) – 12.87%, Netherlands – 11.87% and France has 6.16% of market share. 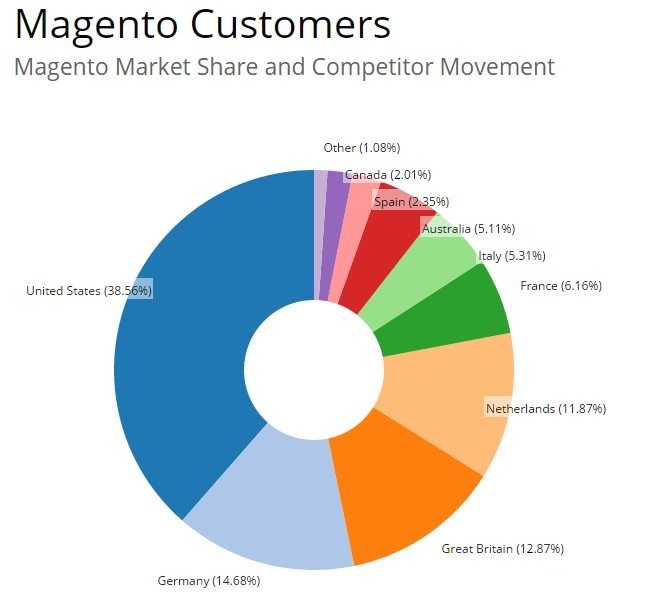 To sum up these numbers we will see that Europe (considering only these four countries) has the share of 45.58%, which is more than that of the USA, making Europe the leader of Magento usage. 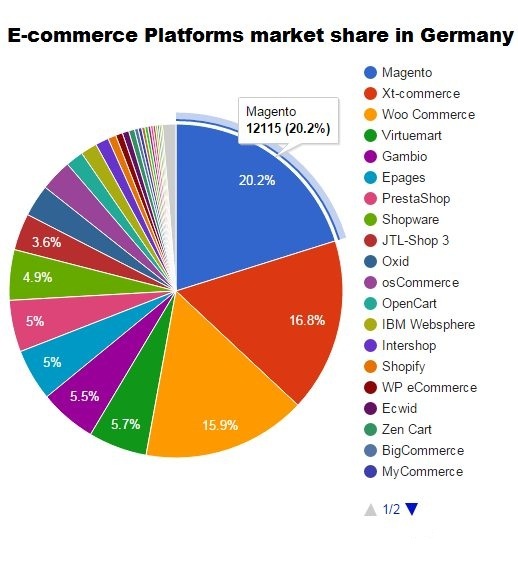 In Germany, 20.2% of all the websites (or 12115 items) use Magento platform for their business. The second popular e-commerce solution is Xt-commerce with 16.8% of market share, and the third popular platform is Woo Commerce with 15.9% of market share. Xt-commerce is a German-based e-commerce software, providing support in both German and English languages. They offer a full package of services, including shop setup, template customization, software migration, e-commerce consulting, various shop extensions and a great number of payment options and security standards for your business. Though, the platform is less customized than Magento, which makes it a better choice for small businesses, rather than mid-sized and large businesses. 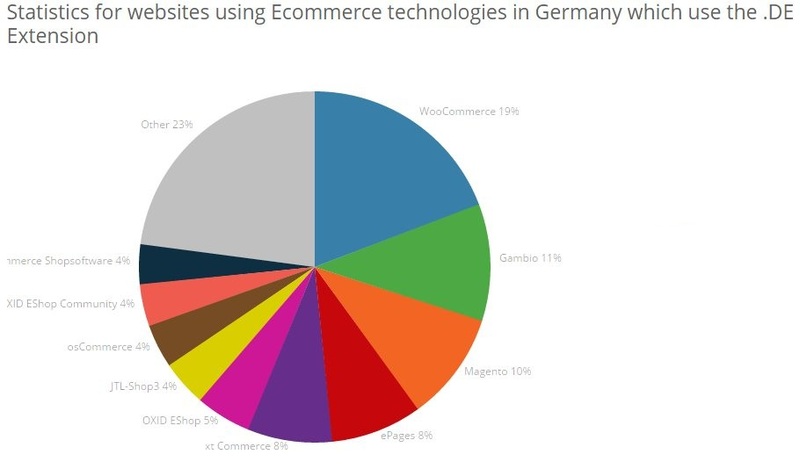 However, to look at the statistics for websites using the .DE extension – only 10% of such websites are using Magento; while 11% are using Gambio and 19% are using Woo Commerce. Gambio is a German-specific e-commerce platform with all the tools and support services in German and a support team located in Germany. 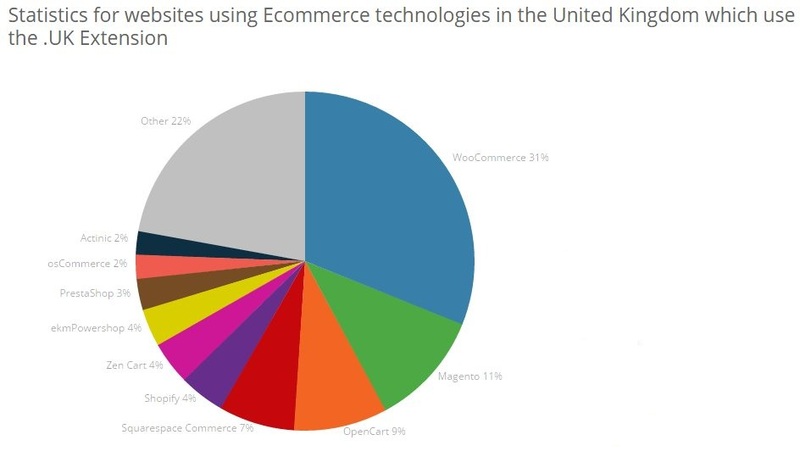 In the United Kingdom 20.8% (or 15646 items) use Magento, 30.7% use Woo Commerce and 5.7% use Shopify for their business. 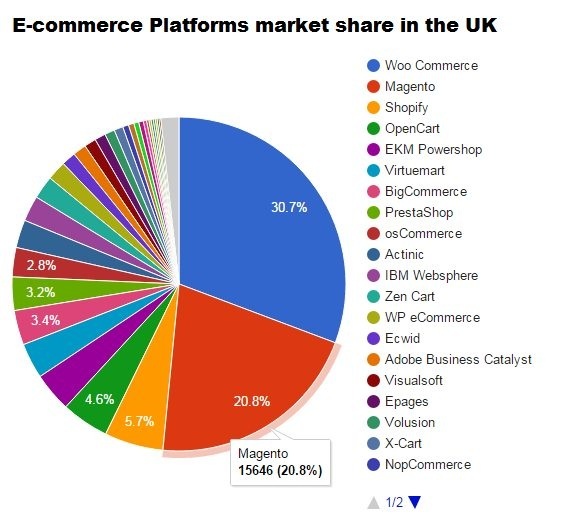 As for the websites using .UK extension – 11% use Magento, 31% use Woo Commerce and 9% use Open Cart. 31.4% of the websites (or 9612 items) use Magento, 29.8% use Woo Commerce and 9.2% use Virtuemart. Virtuemart is an open source ecommerce solution designed as an extension of Joomla. 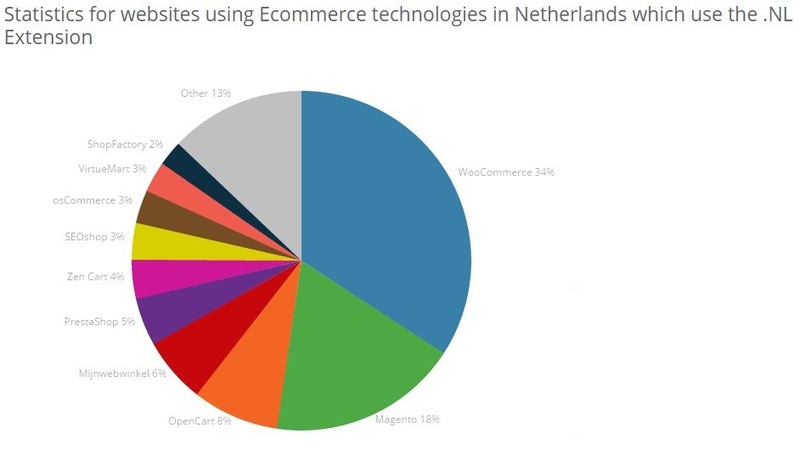 At the same time there are 18% of websites with .NL extension using Magento, 34% use Woo Commerce and 8% use Open Cart. 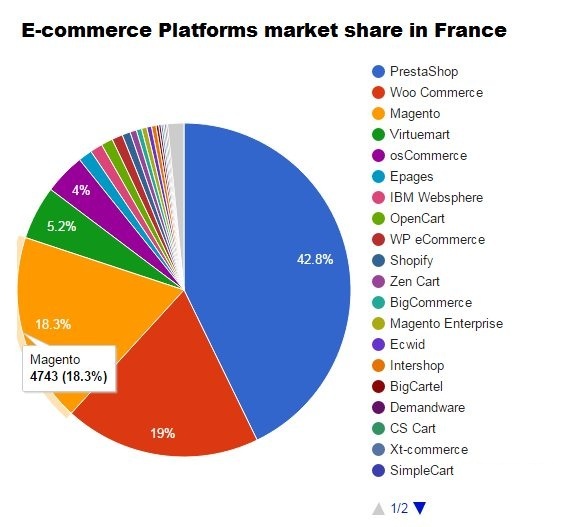 In France, there are only 18.3% (or 4743 items) of websites using Magento, which is the third-popular e-commerce platform in this country. The first two on the list are Presta Shop with 42.8% and Woo Commerce with 19%. Presta Shop is a free open-source e-commerce solution with French roots, their first office was established in Paris in 2011 and is still one of the HQ. 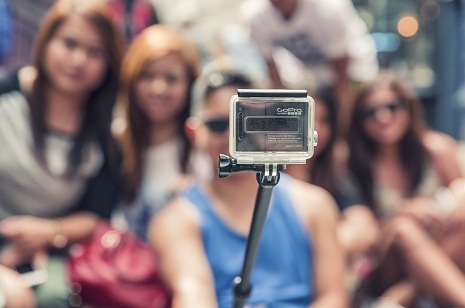 It is available in 60 different languages and is used by 250,000 shops worldwide (having 6.5% of market share and the third place in popularity worldwide). 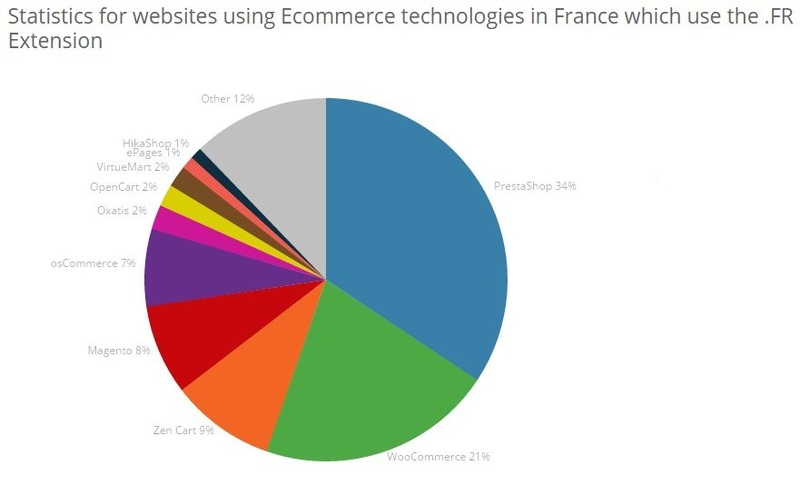 Among the websites with .FR extension – 8% use Magento, 34% use Presta Shop and 21% use Woo Commerce. 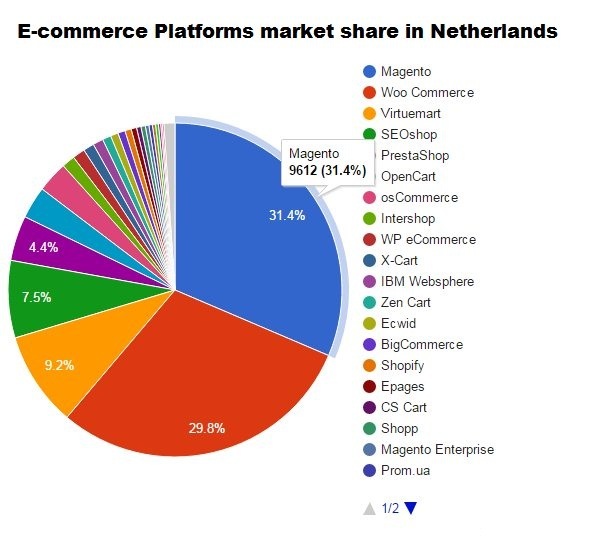 As we can see it – Magento is one of the most popular e-commerce platforms in Europe. We can notice, that there are fewer companies using Magento on websites with county-specific extensions, however, the general number of companies, using this platform for their businesses websites is huge. 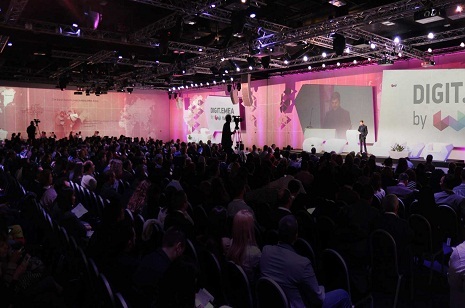 It is also obvious, that the most popular e-commerce solutions in each of the countries studied above are those with a local support team, providing support services in a local language. The main statistical competitor of Magento is Woo Commerce, though, in a global perspective Magento leads. At the same time, we cannot compare these two platforms, as Magento is a standalone e-commerce solution with a great amount of features and functionalities, allowing you to customize your online shop, and requiring a developer in your team; while Woo Commerce is an open-source e-commerce plugin for WordPress, it is quite simple and is a perfect match for beginners. Read this article to know more on differences and similarities of these two most popular platforms. 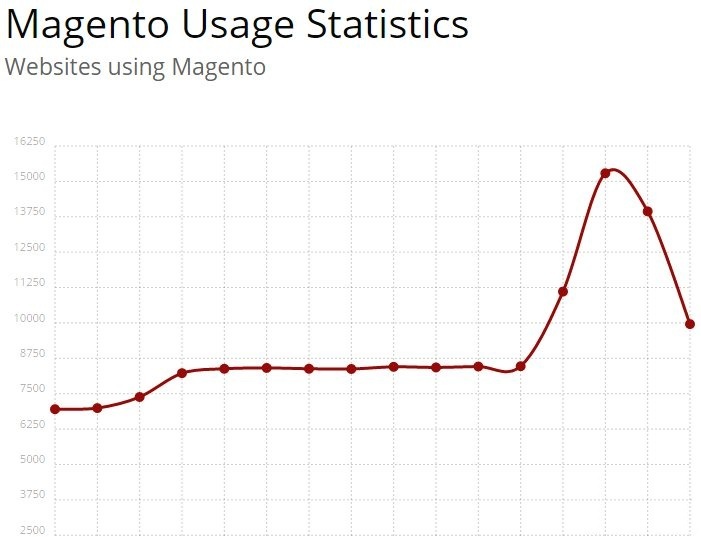 As for the general Magento usage statistics – there was a rapid growth of a number of websites using Magento in November 2015 – which is a statistical confirmation of the growing popularity of this platform. 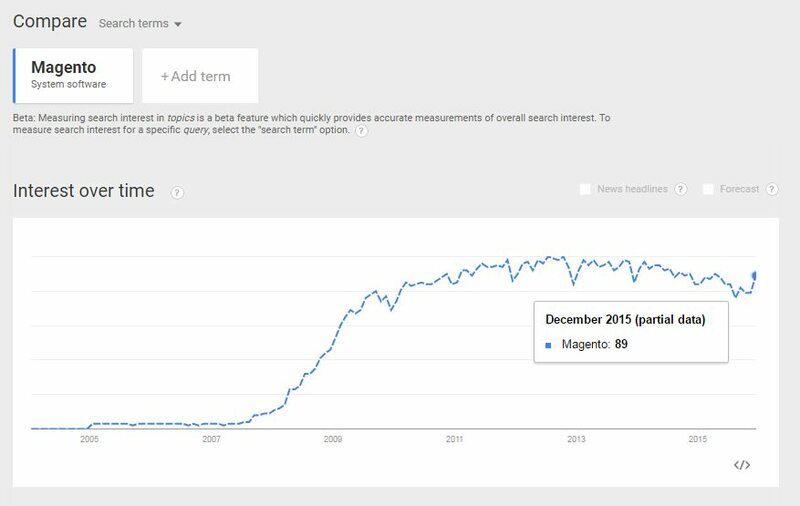 Moreover, we can look at the Google trends to provide you with another proof of the growing popularity of Magento platform. We hope this information was useful and will help you make a decision on the platform to use for your business. Get in touch with us!